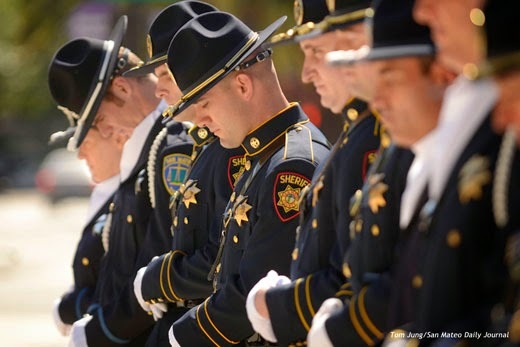 I made this photograph of a Color Guard composed of officers from a variety of San Mateo County law enforcement agencies at an outdoor ceremony honoring fallen peace officers. 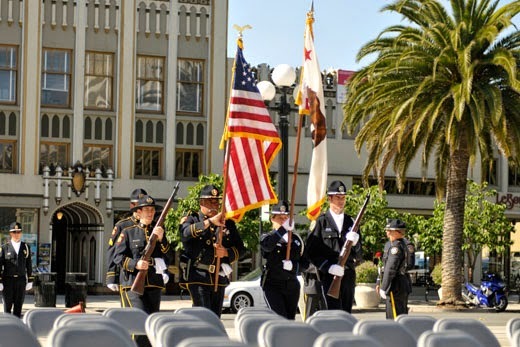 It was held in front of the historic San Mateo County Courthouse in Redwood City. 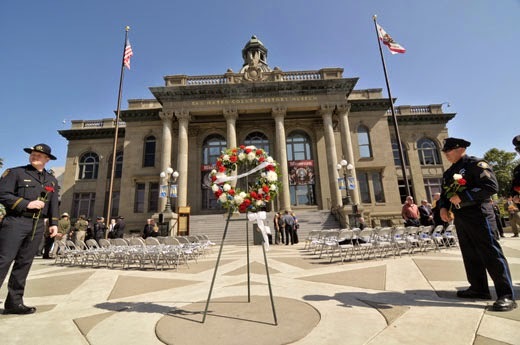 The ceremony consisted of the placing of a wreath at the Courthouse, followed by a reading of the name of each fallen officer and the presentation of a rose in his or her memory. I was given this "whole cloth" assignment just days before it actually occurred. I had some idea of what to expect (flowers, a color guard, a featured speaker, the stately courthouse), but until I actually arrived, I had no idea how these elements could be composed in a visually interesting photograph. As always, I had enough glass to cover almost any possible juxtaposition of foreground and background elements, but being able to photograph from a good position might not be an option. I had arrived about 20 minutes before the official start of the ceremony, so I had plenty of time to work with the visual elements. One such experiment involved placing the County Courthouse in the background. At my widest available setting (11mm on on 11-16 Tokina), I could get the entire courthouse only by standing about 4 feet from the wreath (Photo #1). But I was also in the path the color guard would take when presenting the colors, so that idea was nixed. On top of all that, the image wouldn't be particularly strong, no matter how it was populated. "When you're a hammer, everything looks like a nail". Mr. Speedlight is hard-wired to assume that a supplementary flash is always needed, but when photographing outdoors, light colored sidewalks can provide a natural fill light. So will a light colored building, assuming they reflect enough light in the right direction. It's so liberating to be able to shoot without a speedlight while all of your subjects stand on a natural fill-card, which was the case in all of these images. I was especially grateful for this fact, since everybody was wearing a hat of some sort. Photographing the Colors was another possible image (Photo #2). During the Color Guard's practice drill, I made a few sketch shots, but rejected the idea when I saw how distracting the background was. In addition, flags are very unpredictable - any gust of wind can send one flapping into somebody's face. Of my sketch shots, this was the only one where everybody's face is showing. In the end, it was not a very strong shot, since its "reason for being" wasn't obvious. Moral Quandary: When I made this shot (Photo #3), I thought I had my "Pulitzer". 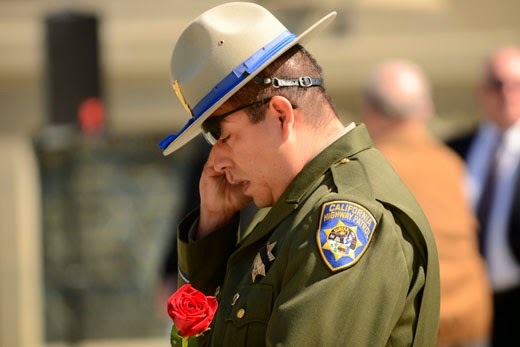 The photo had all of the desired visual elements: the rose and a Highway Patrolman who appears to be wiping away a tear. I say "appears", because he was not weeping, just rubbing his eye. I could argue that if I had just happened upon him, I could have assumed that he was crying. But I knew for a fact that he wasn't, and could therefore be accused of portraying something that didn't actually happen. Yes, he was rubbing is eye, but he was not crying, as most readers would assume if they read the caption. But the photo's impact would have been based on inference, not on what actually occurred. 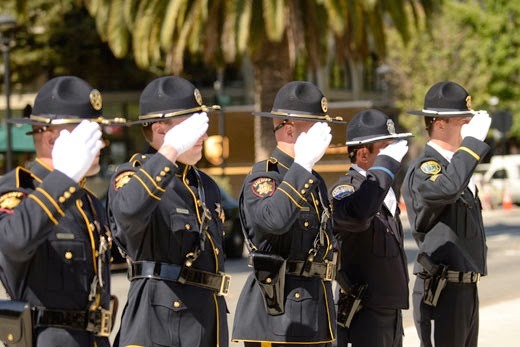 Present Arms: "Present Arms", given as a command, requires all personnel to salute in unison. Although I watched the Color Guard (the team of officers responsible for carrying the flags, or "colors") practice this movement several times, I was totally in the wrong place when it actually happened (Photo #4). Had I been on my toes, I would have taken a position on the left side of the guard so that their faces would be visible. This photo will obviously wind up in my personal purgatory. When I realized my mistake, I repositioned myself on the other side. This is the photo I submitted (Photo #5). Intuitively, I liked the image but initially wasn't sure exactly why. I knew from start that the main focus would be on the one officer whose entire face was visible, which was pure luck. Having their heads bowed as in prayer gave me the context. And the small details, such as the white gloves, the black bands on the badges, and the varied shoulder patches pulled the image together. I felt I had successfully sold the mood with enough details for the viewer to infer the nature of the event. It suffices to say that this shot could only have been made with a large-aperture telephoto lens, which is exactly what I used. The exposure settings were ISO 200, 1/1600 @ F 2.8. The shallow depth of field afforded by the 2.8 aperture and the 190mm focal length helped place the viewer's focus exactly where I wanted it.